Hurricane Camille was the third named storm and second hurricane of the 1969 Atlantic hurricane season. 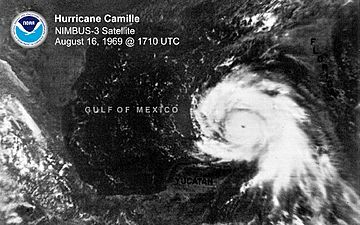 Camille was the second of three Category 5 hurricanes to make landfall in the United States during the 20th century, which it did near the mouth of the Mississippi River on the night of August 17, resulting in catastrophic damage. Camille was the only Atlantic hurricane with official winds reported to reach 190 mph until Allen equalled that number in 1980. The storm formed on August 14 and rapidly deepened. It scraped the western edge of Cuba at Category 3 strength. 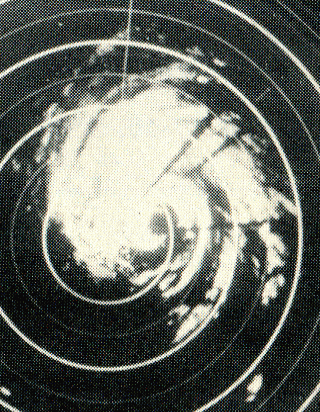 Camille strengthened further over the Gulf of Mexico and made landfall with a pressure of 905 mbar (hPa), estimated sustained winds of 190 mph (305 km/h), and a peak storm surge of 24 feet (7.3 m); by maximum sustained wind speeds, Camille was the strongest landfalling tropical cyclone recorded worldwide, and one of only four tropical cyclones worldwide ever to achieve wind speeds of 190 mph. The hurricane flattened nearly everything along the coast of the U.S. state of Mississippi, and caused additional flooding and deaths inland while crossing the Appalachian Mountains of Virginia. In total, Camille killed 259 people and caused $1.42 billion (1969 USD, $9.14 billion 2005 USD) in damages. National Hurricane Center Track Forecasts for Camille from western Cuba onward. The system's actual track is marked by the line farthest to the west. Ships beached in Gulfport, Mississippi. Flooding damage at Howardsville, Virginia; the bridge formerly carried Virginia Route 626 over the Rockfish River. A large, antebellum mansion destroyed by the high winds and storm surge. Hurricane Camille Facts for Kids. Kiddle Encyclopedia.